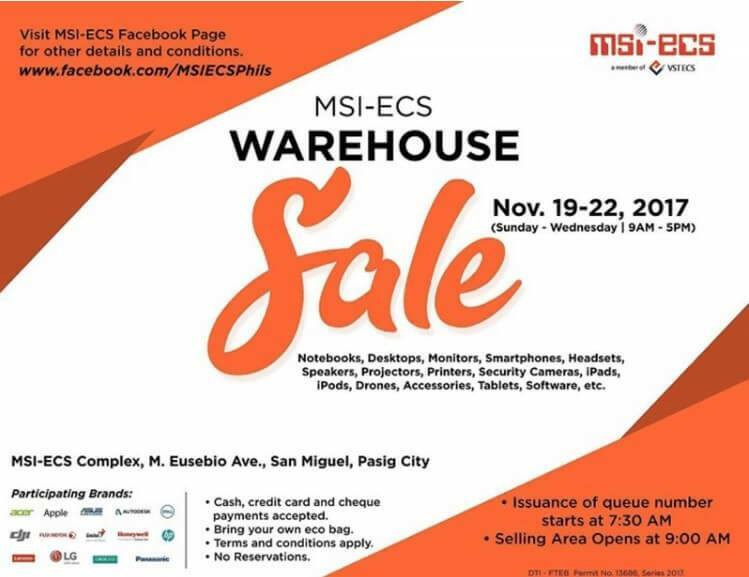 MSI-ECS is currently rolling their Warehouse Sale 2017, cutting down the prices of some of your favorite gadgets and accessories. The Warehouse Sale 2017 is set at MSI-ECS Complex, M. Eusebio Ave, San Miguel Pasig City, and is open from 9:00 A.M to 5:00 P.M. Leading tech brands will participate at Warehouse Sale 2017, too, so consumers are encouraged to go at the venue as soon as possible for first come, first serve basis is strictly implemented. Also, reservations are not allowed. According to MSI-ECS, they will start giving queue numbers at 7:30 A.M, while selling area opens at 9:00 A.M.
For payment methods, MSI-ECS accepts cash, credit card, and cheque payments. Meanwhile, the company clarified that Debit cards are acceptable for straight payments only, while items will be released three days upon check clearing for check payments. For installment payments, they accept major credit cards, including BDO, RCBC, Metrobank, and BPI. The Warehouse Sale is open until November 22.